The festive season is fast approaching, in fact you could argue that it has already begun! The season of gift-giving, healthy living and that summer feeling means one thing, the 2018 Seasonal Catalogue is finally here and is packed full of festive flavoured shakes, snacks and promotions that are sure to get you into the spirit of giving. 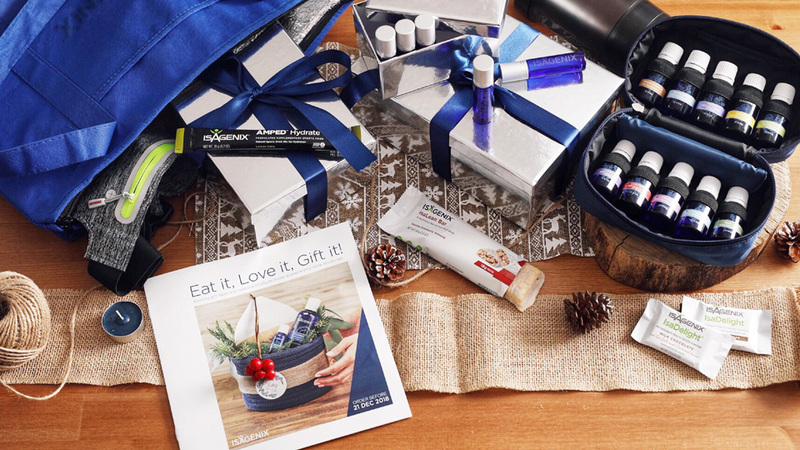 Whether you’re looking to revolutionise your own Isagenix® health and wellness journey or searching for the perfect gift for those near and dear to you, we have some incredible products that are set to make your gift-giving experience all the merrier. Why get caught up in the Christmas rush when you can shop from the comfort of your home by heading to ANZIsagenixSeasonalCatalogue.com. Check out the digital Seasonal Catalogue to see everything we have to offer including specials on some of your favourite products! Here’s a sneak peek of what you can expect to see in the seasonal catalogue this year. Like the sound of something? Don’t wait to purchase it, these products are all limited edition and when they’re sold out, they’re gone! We’ve brought back fan favourites Salted Caramel and Mocha IsaLean Shake. There’s no better way to help you and your loved ones achieve your health goals this season. This Seasonal Bar is filled with the flavour of juicy berries and sweet vanilla making it the perfect alternative that anyone with a sweet tooth is sure to adore. This one’s for all the chocolate lovers out there! Introducing our IsaDelight Variety Pack that includes your familiar flavours with the all-new Dark Chocolate with Mint flavour! Take your oils on the go with our Essential Oils Roller Bottles or Travel Case so you’ll never be without your favourite singles or blends! It wouldn’t be a Seasonal Catalogue without a bit of Merch! Pick up a handy Isagenix Cooler Bag with your Summer Survival Kit or for those keen to kickstart their New Year’s Resolutions early, get your hands on a lightweight runner’s belt to keep your fitness in on track over Christmas. All seasonal products and promotions are available for a limited time on Wholesale order while stocks last.